I don’t think the Disgaea franchise gets quite the level of appreciation that it really deserves. It’s a cult favourite franchise, of course, and generally reviews well, but oftentimes critics and players alike are fixated on the immense depth that it offers within its combat system as the basis for their appreciation of each game. Related reading: Matt's review of Disgaea 4 on the PlayStation Vita. And of course Disgaea does offer immense depth. 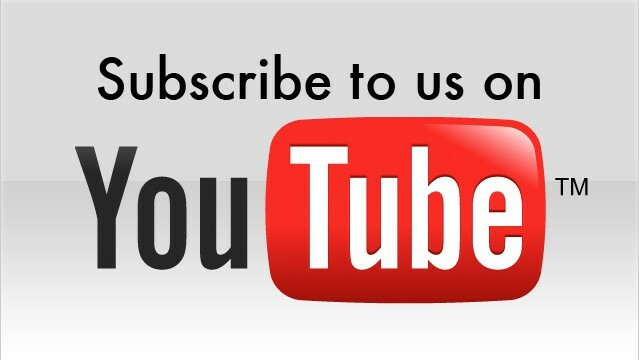 And, equally, that depth is worthy of praise. But there’s much more to these games than that, too, and I think it’s that discussion around the series’ other elements is lacking somewhat. Firstly, though, I think that fixation that we all have with the mechanical depth of the series will persist into Disgaea 5, the first appearance of the franchise on Sony’s PlayStation 4. 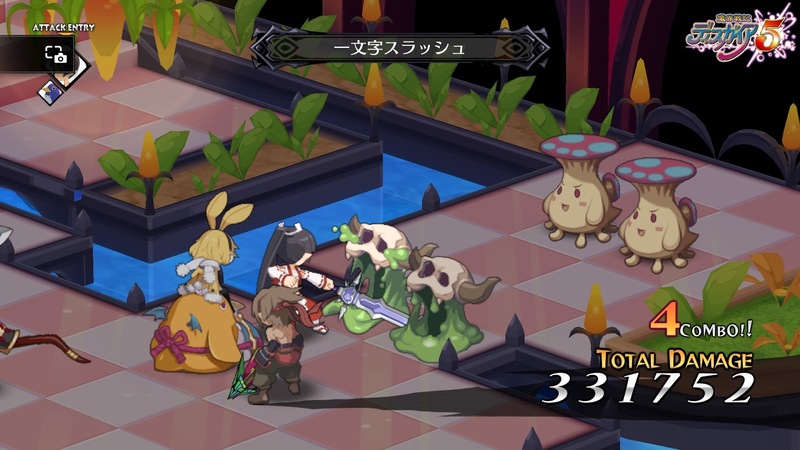 In essence, the development team at Nippon Ichi have used the additional power of the PlayStation 4 to ramp all the many systems that underpin the game’s extreme tactical depth up to 11. Bigger battles feature more units than ever before, and this one also has the most complex interactions between units that we’ve seen to date. 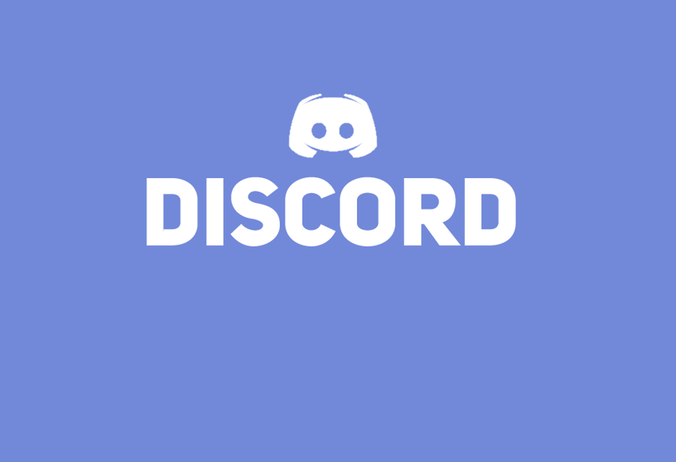 Combined with the series’ tradition of being able to break well beyond the level 99 cap of most RPGs to level characters all the way to 9,999, and then level up their equipment as well, and you’ve got a game that counts its total content in triple figures – you’re going to need hundreds of hours to see everything this puppy offers. It should not be surprising, given the sheer density of the game’s systems, that there is no way I could even begin to describe everything that you’ll get up to in Disgaea 5 in a coherent way in a review, so I won’t. 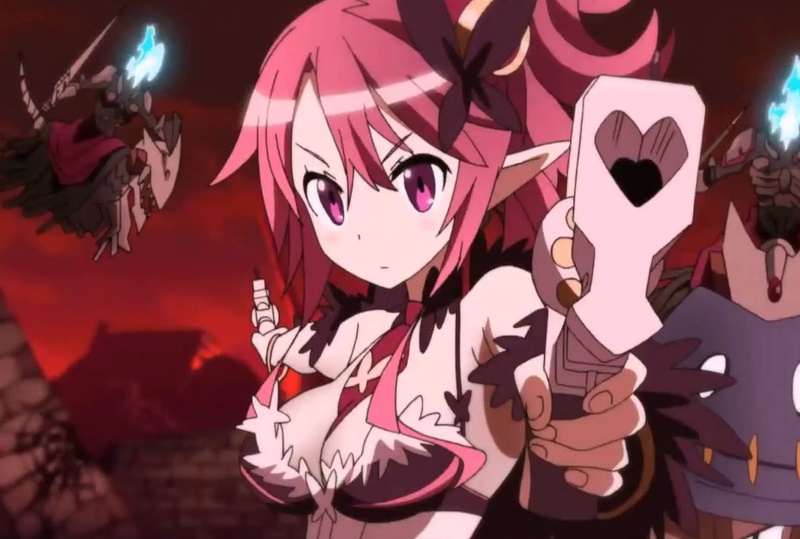 What you need to know is that firstly Disgaea 5 is simply not accessible to people who are unfamiliar with the basics of tactical RPGs, and secondly balancing is all over the place and difficulty spikes that require a genuinely old-school attitude towards grinding are frequent. This is nothing that Disgaea fans will not already be aware of, but it could very well come as a very intimidating shock to newcomers. 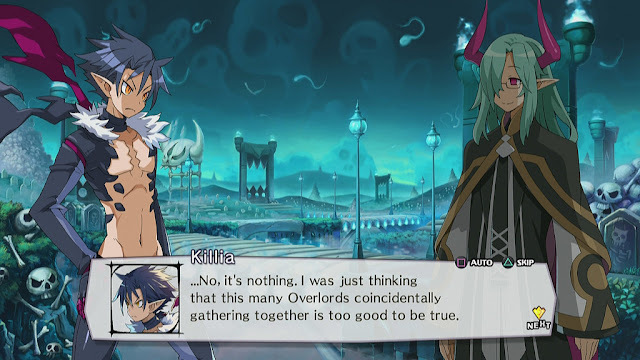 The various tutorials that the game offers do a great job of easing players into the systems, and most of the complex features are only unlocked hours into the game, so I don’t believe that anything in this game will actively confuse players, but Disgaea 5 remains one of those titles where competence only comes from a lot of practice. Thankfully, however, the Disgaea 5 has enough sense not to assume a player has knowledge of what happened in its predecessors. It is set in the same universe as the previous games, and there are plenty of nods to reward series veterans for their faithful service, but if this is your first Disgaea, you’re not going to have any difficulty in following along with the narrative. And that’s just as well, because it’s the narrative – not the systems – that I believe to be the real lasting strength of this series, despite being something many might gloss over. It’s difficult to do satire at any time, but it becomes exponentially more difficult to do satire when you’re trying to sustain it for hundreds (and hundreds) of hours. I’ve rarely seen a developer handle a light hearted, comedic narrative over such a lengthy period of time as well as what I see in every Disgaea entry, and the Disgaea 5 is no different in this regard. Characters and scenarios represent a mix of slapstick, sarcasm, and more subtle parody humour, and this is supported by the endlessly bright, colourful, and humorously absurdist approach to visual aesthetics. There’s a gaudiness to Disgaea that I took the longest time to learn to appreciate, but after a half dozen or so different games in the series I’m now sold on it for what it is; it’s garish on the surface, but that both overtly and subtly it’s the only approach to the visual aesthetic that could possible support the humour over such an extended run time. And on the PlayStation 4, the developers at Nippon Ichi are finally working with hardware to properly realise their vision. The richness of colours that flow through the television screen when playing Disgaea 5 are one thing, but the real secret to this game’s success is in the subtlety that the engine also enables. The smallest character movements are now – finally – noticeable, thanks to the hyper-detailed sprites, and that makes characters such Red Magnus, the Homer-Simpson-If-He-Were-Ripped beefcake warrior guy all the more amusing as his vacant reactions to everything around him are presented as much through animation behaviours as they are in dialogue text (which is previously all Nippon Ichi had to rely on). 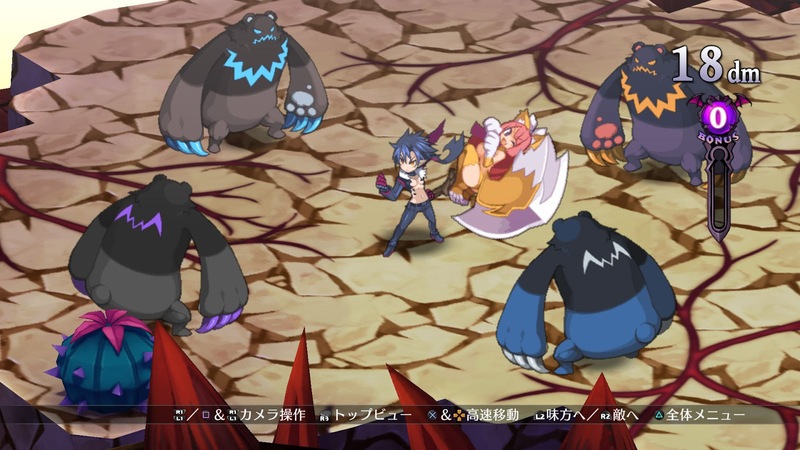 The raw excess of Disgaea 5 also flows through to the character designs. Nippon Ichi had complete freedom to design to their heart’s content, with the colourful hell that marks the setting a happy hunting ground for artistic license, and on the PlayStation 4, the faintly disturbing and twisted beasties that inhabit the world are realised beautifully. There’s an undeniable charm to the exaggerated manner in which both the sexists of men and women and the ugliest of zombies bop around in this game. Without this attention to detail, it is safe to say that this game would have much less of the personality that it does, and now I don’t think I’ll be able to go back to previous titles in the series, as they will look bland on the eyes by comparison. And yet for all the extreme excess, Disgaea games have always had the faintest whiff of serious undertones to them that helps to balance out the humour, and this is perhaps the most impressive thing about the series, which has been carried on in style in the latest edition. Too often a game will gun for humour and then go all-out with it, desensitising and then boring the player in the process. But not Disgaea 5. In the hub world between missions some relaxed lounge music massages and soothes the ears after they’ve been blasted by the series’ distinctive hyper-active electronic soundtrack in a battle just a minute before. 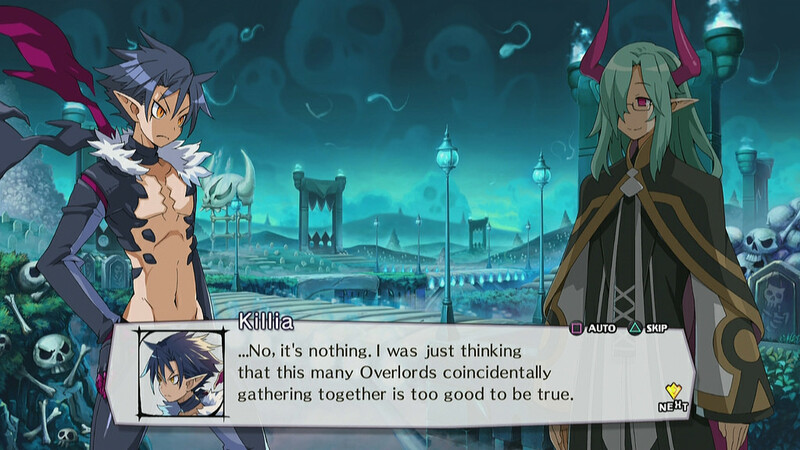 Meanwhile, Red Magus might be a (very) large walking pun, but the lead hero, Killia, has something of a tragic background, giving him a Final Fantasy VIII Squall-like nihilistic outlook on life. In fact, there is an oddly tragic underpinning to most of the major characters in the game, with some struggling with inner demons (hah, a pun there, given they are demons! ), while others carrying the weight of personal tragedy, and even the comic relief – such as the curry-obsessed girl that rides a brightly coloured, penguin-like prinny, have their moments designed to build both sympathy and empathy within the player. Disgaea games do a better job of characterisation than most give them credit for, and Disgaea 5 is no different in this regard. That’s not to say that the narrative that is especially innovative or philosophically deep – Danganronpa or Nier this is not – but within its boundaries Disgaea 5 demonstrates an absolute precision in balancing out narrative pacing with depth of characterisation, and has an absolute mastery over the ebbs and flows that the finest of comedy needs to have in order to be able to sustain itself over a long period of time. 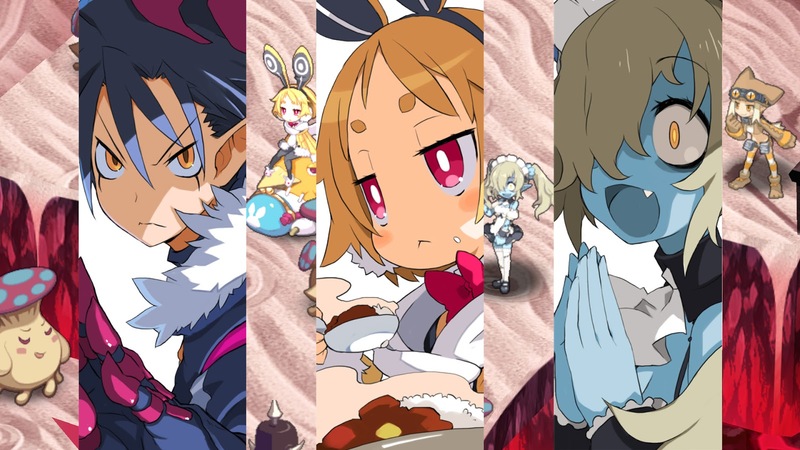 For a series that is famed for being all about excess, it’s the restraint that Disgaea 5 often indulges in that really sets it apart from its peers. It’s also hard not to get attached to each and every character that you have in your company of misfits, which starts out as a small band of individual heroes, but quickly swells into a far bigger squad than you’ll be managing in almost any other tactics RPG. Battles are also much larger, sprawling affairs than even veterans of the tactics RPG genre will be familiar with. With that size and scale there was always going to be the potential that individual characters would be lost, but the ability to customise the character, from name through to colour, and then the amount of control that you have over their development means that each character has a “personality” and distinct role within the team that you’ll quickly become attached to. Related reading: For a classic Disgaea, check out the second, available on the PlayStation 3 as a PlayStation 2 classic. This is a game that simply couldn’t be made on the previous generation of hardware, and this is why Nippon Ichi refrained from attempting a PlayStation Vita port. Disgaea 5 is a PlayStation 4 exclusive because the developer needed the extra power, and it has done a masterful job with it. This is by far the best Disgaea game we’ve seen, and it is a strong contender to be the best tactics RPG ever created. Item Reviewed: Review: Disgaea 5: Alliance of Vengeance (Sony PlayStation 4) 9 out of 10 based on 10 ratings. 9 user reviews.